Previously: Ethan Carter III defeated Eli Drake in last week's main event. After the match, The DCC beat down EC3, Drake, and Tyrus. Also, Bobby Lashley defeated Jeff Hardy to retain the TNA World Heavyweight Championship. 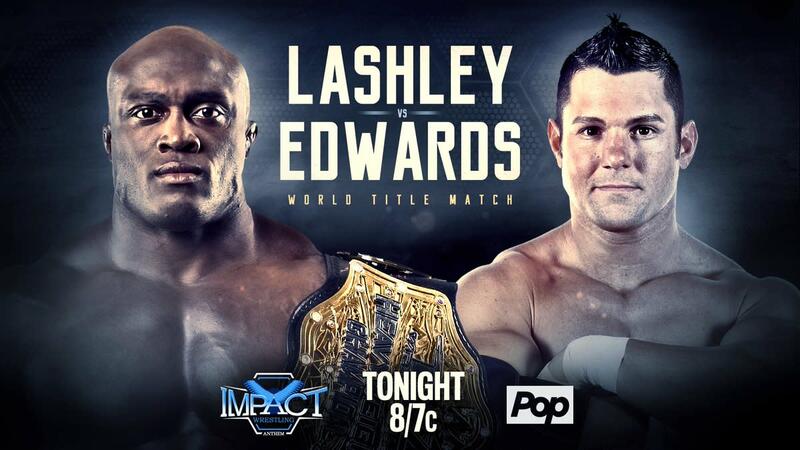 Tonight: Bobby Lashley defends the TNA World Heavyweight Championship against Eddie Edwards. - In the back, The Broken Hardys, Reby, and King Maxel arrived at the Impact Zone. Matt criticized Maxel’s poor eating habits. Matt promised that tonight all would be revealed. - The DCC came down to the ring. James Storm mentioned that The DCC kept their promise to run through all of the talent in TNA. Eli Drake and Tyrus interrupted The DCC. The audience doesn’t deserve to hear Drake's voice so Tyrus was doing all of the talking. All five guys ended up brawling around ringside. Storm gave Tyrus a low blow, but somehow Tyrus caught his arm and countered it. Drake wanted a third partner but Tyrus thought they could win without a third guy. The DCC isolated Drake in their corner to start the match. Tyrus came in and they kept Bram on their side of the ring. James Storm got the hot tag and briefly ran wild on Drake. Tyrus came back in and dominated The DCC. Drake abandoned Tyrus, leaving him on his own. Tyrus cleared the ring and gave Kingston a suplex but Storm nailed him with a superkick to win the match. - Backstage, Allie and Braxton Sutter both reached for a water bottle and touched hands. Maria Kanellis interrupted them and sent Allie away. Maria is forcing Sutter to propose to Laurel Van Ness later tonight. - Brandi Rhodes came down to the ring and called out Rosemary. Rosemary mentioned that they offered Brandi a spot in Decay but she’d rather fight. Abyss and Crazzy Steve surrounded Brandi, leading to Rosemary locking on a submission until Moose ran out for the save. - In the back, Moose and Brandi challenged Decay to a mixed tag match next week. Moose said if you mess with Brandi, you mess with Moose. Before the match, Spud introduced Aron Rex by singing his name. Rex made Spud sing his name several more times before Robbie E finally interrupted. The finish of the match came when Spud was pulled into the ring and Robbie went after him to throw him out. Rex adjusted the rings on his fingers and hit a loaded punch, knocking out Robbie to win the match. - In the back, Eddie Edwards prepared for his match against Lashley with his wife Alisha, Davey Richards, and Angelina Love. - Backstage, Mike Bennett approached Braxton Sutter. He slapped Sutter on his back, knocking the water bottle out of Sutter's hands. Bennett gave Sutter a pep talk for the upcoming proposal. Bennett told Sutter that he knows he’ll do the right thing and Sutter agreed. - The Hardys entered the ring and Matt introduced Vanguard 1, which has been updated by the Seven Deities. Vanguard 1 is now a transportation device that'll take them to every promotion in the world to win all of the tag team titles. The Hardys want to prove they’re the greatest tag team in space and time. Matt pointed out that it could take them to any promotion, including The Honorable Ring where they could face the Bucks of Youth. They put their hands on Vanguard 1 and disappeared from the Impact Zone. They teleported to Tijuana, Mexico to begin the search for the tag team champions. Shera controlled the early part of the first round and hit the Sky High but it was after the round was over. The judges gave the first round to Shera. Shera charged at Galloway to start round two but he got wiped out with a big boot. Galloway hit the Claymore, followed by the Future Shock DDT to win the match in round two. - In the back, Sutter approached Laurel Van Ness and tried to break off their relationship. He dropped his water bottle and went to pick it up. Van Ness assumed he was proposing and said yes. She celebrated and went to call Maria. Sutter tried to explain himself but it was too late. - The Helms Dynasty came out to the ring. New X Division Champion Trevor Lee said he’s the crown jewel of the X Division and the Helms Dynasty. Shane Helms said he feels that Andrew Everett is the weakest link of the Dynasty. Helms told Everett he’s going to trim the fat. Everett snatched the mic from Helms and told him he’s wrong. Helms and Lee jumped Everett and beat him down. - Back in Tijuana, The Broken Hardys searched the streets for the tag team champions of Mexico. The journey through the streets led them to the Auditorio Municipal. Alisha and Angelina Love were sitting at ringside. Lashley got the advantage on Edwards and went over to taunt Alisha and Love. That gave Edwards the chance to hit a suicide dive. Edwards hit a second dive and a missile dropkick for a near fall. Lashley tried to hit Edwards with the World title but Davey Richards ran down and grabbed the belt. Edwards made a comeback and went for a third suicide dive but this time Lashley caught him and hit a sick belly-to-belly suplex on the floor. Lashley went for the spear but Edwards hit the Boston Knee Party. Edwards had the match won but Richards pulled the referee out of the ring. Richards yelled at Edwards and Angelina Love knocked out Alisha, which distracted the referee. Richards hit Edwards with the title belt and Lashley hit the spear to win the match. After the match, Richards choked out Edwards with his belt while Love forced Alisha to watch. Next Week: The Expedition of Gold begins when The Broken Hardys challenge Super Crazy & Psicosis for the Crash Tag Team Championship in Tijuana, Mexico.